Last week my daughter started school full time. She was desperate to start, having seen her brother start two years ago, and wanting to be just like him. She is incredibly lucky to be at school. Globally there are 58 million children out of school without access to basic education. This is something Persil are keen to address, and as such they have just launched a 'Learning for Tomorrow' initiative, in partnership with Unicef. Every child deserves the right to education. To learn, to read, to grow. It breaks my heart that so many children around the world are denied that opportunity. My daughter's first day at school was infinitely different to so many children around the world. We leave for school five minutes before they need to be there and walk/scoot/run/jump to school. The first day didn't involve any tears (from her), she was so pleased to be going to 'big school' that we struggled to get a wave goodbye. Although she has been incredibly tired most days, she adores being at school and spending time with her peers. It's a small village school and children of all ages play and learn together. It's such a wonderful environment and I am incredibly grateful that she can have a good education. Persil understand that the school day teaches them so much more than just reading and writing – they also learn vital skills such as making decisions, choosing friends, getting messy, and learning from their mistakes. These are skills you won’t find in any textbook. Persil is giving UNICEF €1.4 million to kick-start Learning for Tomorrow in 2015. Initially programmes across Brazil, India and Vietnam will benefit from literacy activities and awareness campaigns. Learning is so important. In the UK we really do take it for granted. Parents will go to extreme lengths just to get children in to the 'best' school. The very fact that we are privileged to have so many schools within our communities is wonderful. We were sent a lovely back to school pack ahead of my children returning to school. I had forgotten how much I need a pack of Persil to get those horrible stains out of their clothes. I have already put it to work and am impressed with the results. 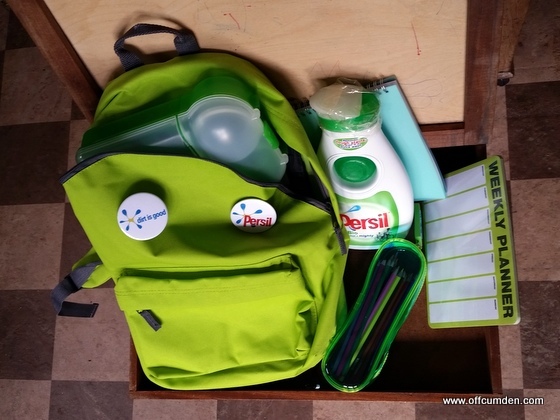 Persil small and mighty comes in four sizes and is made from packaging which can be recycled. Prices start at £4.69 for 525ml and go up to £13 for 2100ml. Disclosure: We were sent the pack for the purpose of the post but all opinion is my own and this post is honest and fair.